Join us at 6:30 pm. 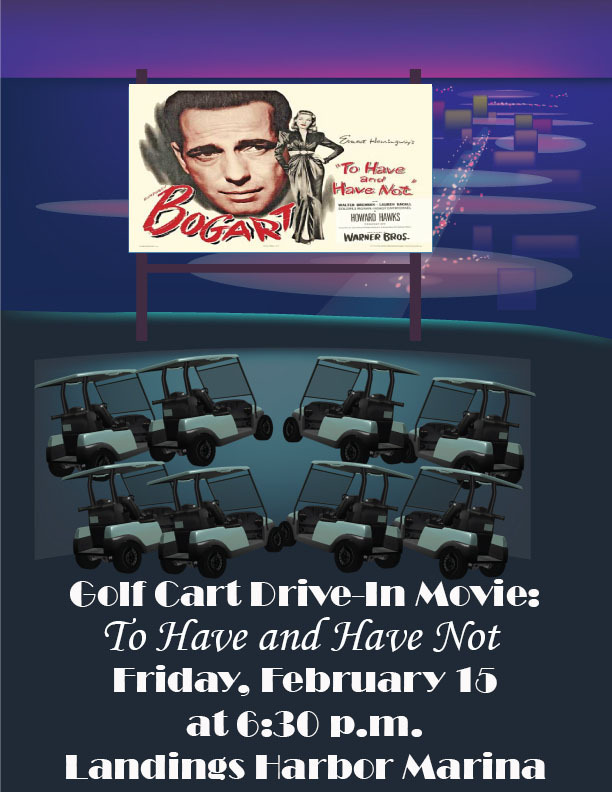 on February 15 at Landings Harbor Marina for a nostalgic date night tradition with a modern twist...a classic drive-in movie for golf carts! If you do not have a golf cart, you may bring a folding-style lawn chair. Bring your favorite movie snacks and blanket to settle in for a fun movie under the stars. About the Movie To Have and Have Not Harry Morgan and his alcoholic sidekick, Eddie, are based on the island of Martinique and crew a boat available for hire. However, since the second World War is happening around them, business is not what it could be. After a customer who owes them a large sum fails to pay, they are forced against their better judgment to violate their preferred neutrality and to take a job for the resistance transporting a fugitive on the run from the Nazis to Martinique. Through all this runs the stormy relationship between Morgan and Marie “Slim” Browning, a resistance sympathizer and the sassy singer in the club where Morgan spends most of his days. You do not want to miss this fun evening. So roundup all of your friends and make plans to meet us at the Marina. We can't wait to see you!